ProEdge replacement blades will fit ProEdge knives above as well as most every hobby knife on the market today. These USA made blades are double honed from high quality carbon steel. These blades are sharp and stay sharp! CARBO SMOOTHING STONE (#0875) takes the rough edges off glass. Especially useful when working with heavily textured glass. One pass is generally enough to take the little shark teeth off the edge. Or lay stone flat on your work table and draw glass across serrated surface to smooth. Will do minor grinding as well. 10x2"
can do everything the brass bristle brush above can, but is especially handy for pate de verre work or in any application where you are scratching stuff that is stuck to the glass surface. The stainless bristles will not transfer metal to the glass surface as brass brushes do. 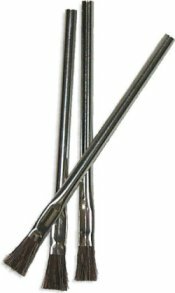 FLUX BRUSHES (acid brushes) for applying flux, patina, silver protector etc. Always use a clean brush for each project. Never go from your flux container to your patina bottle with the same brush. NOTE: These are top quality #1 Acid Brushes and are made to last. Horsehair bristles are held firmly by a staple and then double crimped to the handle. Bristles are trimmed to a 3/4" length, but feel free to shape or trim to your preferred size with scissors. Well made product for the same price as cheapo model offered elsewhere. is a soft, long bristle brush for sweeping bits of glass off the work bench. is the traditional tool used by your grandparents to open their lead channels. 5" long.